Set in the Netherworld where all things demonic and treacherous are celebrated, you play as Prince Laharl and his rag-tag collection of misfits, hired help, and explosive penguins. Upon waking up from a two-year-long nap Laharl discovers that his father is dead and that other demons are starting to make their move to claim his crown. He decides to get proactive about establishing himself as the true Overlord by beating up as many demons as he can through the art of grid-based strategy and flashy attacks. It’s a quirky set up for a strategy RPG, but it’s one that’s worked incredibly well since 2003 on consoles, and it’s only now that it’s made the leap to Steam. The PC port is based on the PSP’s Afternoon of Darkness rather than the PS2 original so it comes with a few tweaks and the hidden Etna Mode—a scenario that see Etna accidentally kill Laharl at the start and so she endeavours to take his place instead. It also comes with a full suite of launch problems including huge FPS drops, screen tearing and random crashing. While any graphical issues and bugs can eventually be patched out, it’s the other choices that the dev team have made with this port that really let it down. It feels like someone has taken a checklist of what a PC port should have, then only picked a handful of them without thinking through if they’d actually be suitable for a game with small maps and pixelated sprites. Depth of field and other options that rely on blurring techniques are a bad fit for Disgaea’s small but well formed character models, and a lack of even basic resolution options feels like a massive oversight. The new map textures are the one thing that feels like an actual upgrade, albeit a small one, and all of the menus have been redone to make things clearer to read, but even that has been let down by a terrible and distracting choice of font. You can switch to the old menus if you wish, but they also use old and blurred character portraits so you’re left with a choice between which style you find least offensive on your senses. It’s only a shame because the game underneath it all is great. A tactical strategy RPG like Disgaea is an excellent fit on PC, but this port really could’ve used more time and effort. Clicking through positions and attack menus with a mouse is a great idea, but it feels rushed and inaccurate here. Also, why do I have to select individual letters to name a character instead of just being able to type it in? They haven’t even used Xbox or PS4 controller button prompts, it’s just numbers. It all feels disappointingly lazy, and it does a great disservice to the actual game. If you’ve got the patience to put up with all of these issues you’ll find a surprisingly deep strategy game filled with likeable characters (even the evil ones) and funny writing. Clearing a map of its resident zombies and ghosts takes a fair bit of thought—positioning your team together to chain attacks is the key to success, but with enemies scattered across the map at different height levels that’s easier said than done. Throw in Geo panels—obelisks that effect coloured tiles with various stat boosts and hindrances—and each stage becomes more like a puzzle than a fight. You can be clever about who you pick to join your team, who you attack first and how you throw people to cover greater distances, but if that’s not your style you can also completely overpower any adversary through grinding previous stages. Despite all of my years playing the Disgaea series on consoles I’ve just never been able to master the correct application of lifting and throwing, so I picked the grinding path to victory, and not once did it feel like a chore. Part of the series’ appeal is that you can overlevel any character into a monster capable of unspeakable things with damage numbers, and you can even dive directly into your own weapons to make them stronger through an ‘Item World’. Every stage with an item is completely randomised so when you’re done with the story there’s an endless number of stages for to challenge yourself with. You can dispatch 10 units per stage, and while you start with a few prinnies and you meet various ne’er-do-wells on your travels, the Dark Assembly is where you want to do your recruiting for the most useful classes. You’ll be able to find healers, archers and mages, etc, to do your bidding by spending mana earned from the people you’ve already murdered. You can also use that mana to petition senators within the Assembly to do stuff like provide the item shops with more stock or extort them for funding. The more powerful a character is the more influence they have—just like a real government. 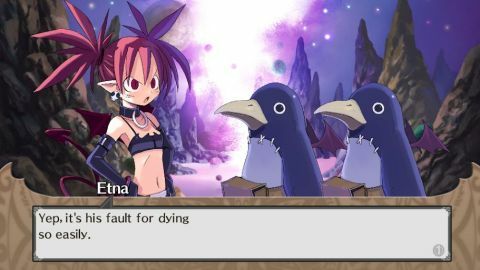 When I first played Disgaea on PS2 I lost over 200 hours to it because I kept finding new corners to explore, its intricate systems and endless leveling pulling me in ever deeper, but the PC version has left me cold. I can’t go 10 minutes without being distracted by a bug or inaccurate clicking so I’m never being drawn in. The frustration the port is causing makes it hard to want to put the effort in. It makes me feel guilty, there’s a great game here just waiting to be played, but this version of Disgaea is just not worth the stress.